These pouches are 9x11.5" in size. This is the correct size for standard US Letter Size (8.5x11") sheets of paper. These pouches are 3 Mil. Many laminators DO NOT have temperature control and instead are preset to work with 3 mil pouches. These pouches are photo quality and laminate with a crystal clear finish and are not tinted. This 600 pack of Apache pouches works with all Apache Hot Laminators also available on Amazon by searching for "Apache Laminator". The corners are all rounded slightly. One lengthwise seam is of the pouch is closed to help keep the laminate in place through the laminator. This also helps to reduce air bubbles. Apache Laminator pouches work with all other brands of laminators and do not require a carrier pouch. These pouches are not "self-laminating" and are permanent once passed through a thermal laminator . A hot or thermal laminator is required for these to work. 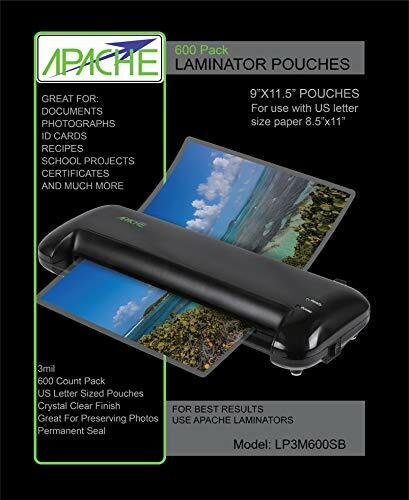 Apache Laminator Pouches are great for Photos, School Projects, Presentation Documents, or anything else you want to protect.